Today, we had lunch with some very special friends. They are also members of the Sassie Lassies Red Hat Society, and shared their Christmas in July celebration with us! 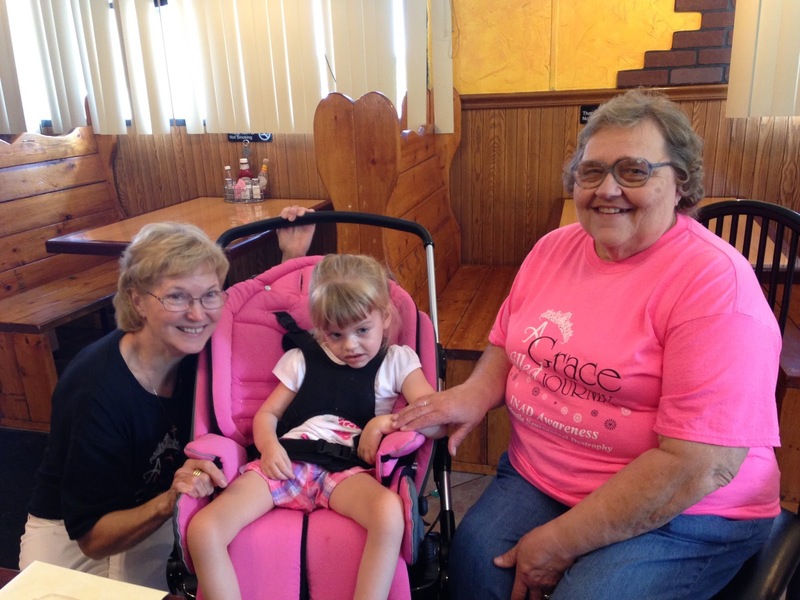 Several weeks ago, my friend Sharon Schwab, asked if Grace could come to their Christmas in July party in Litchfield. Instead of exchanging gifts this year, they wanted to make a donation to the INAD research study. This awesome group of Sassie Lassie Red Hats shared their Christmas in July party with us! Sharon has always been one of my very favorite people, so I couldn't turn her down, even if it was a paper night. It's hard to be gone on paper nights, but luckily I talked the boss into letting me have a few extra minutes for dinner. She even rode with us. Before that night, Sharon had asked me to write out part of Grace's story that they could share with their members, and we were happy to oblige. Grace had fun when the ladies were talking to her, and even got to try on the pink, sparkly hat! When it came time for the party, mom rode over to Litchfield with me and Grace, and we were greeted by their entire club, and a bunch of presents for Grace, and even a box for me! Grace got some new stuffed animals, snacks and some Capri Sun drinks. And waiting for me were two beautiful angels in a butterfly box. We certainly felt loved by such a sweet group! Although we could only stay about a half an hour, it gave us time to share our story, and for Grace to get to see the ladies. She even got to try on a sparkly hat, and she just loved it! They even sent dinner home with us since we couldn't stay for the whole party. And we had to promise to have lunch with Sharon and Joetta so they could give us the money for the study, and we were shocked they had more than $200 for the study. We truly live in such an amazing community. Having lunch today with Sharon and Joetta. As we chatted throughout the lunch, we talked about Grace and the club, and how blessed we are to be surrounded by such loving friends.